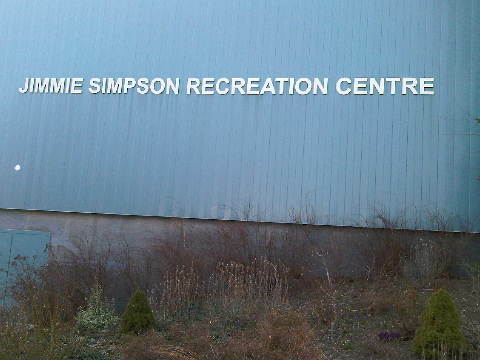 Crossing into Leslieville at the underpass on Queen Street near McGee, you immediately see a big blue building, the Jimmie Simpson Community Centre. 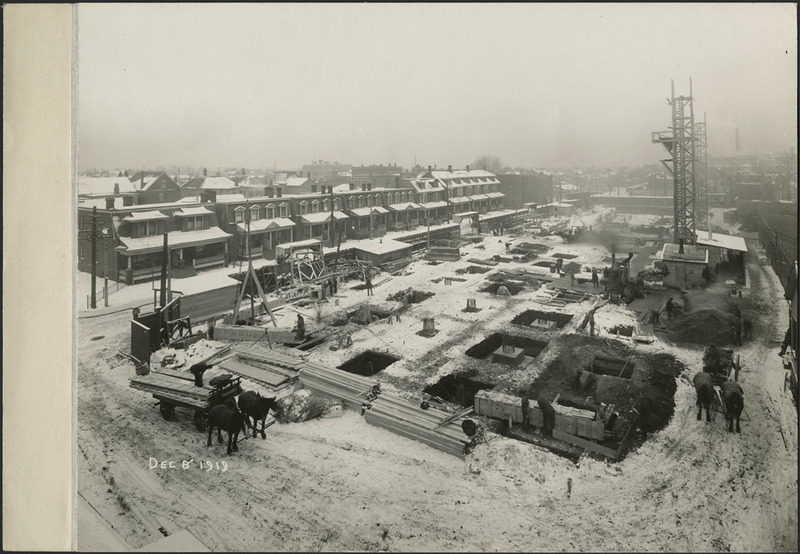 You don’t see a densely packed terraces of houses on narrow streets or the giant factory that replaced them. But maybe you catch a faint bad odour? It isn’t old tires burning. It’s the ghost of the Dunlop Rubber & Company factory where hundreds of people worked from 1905 to 1970 when the plant abruptly shut down. 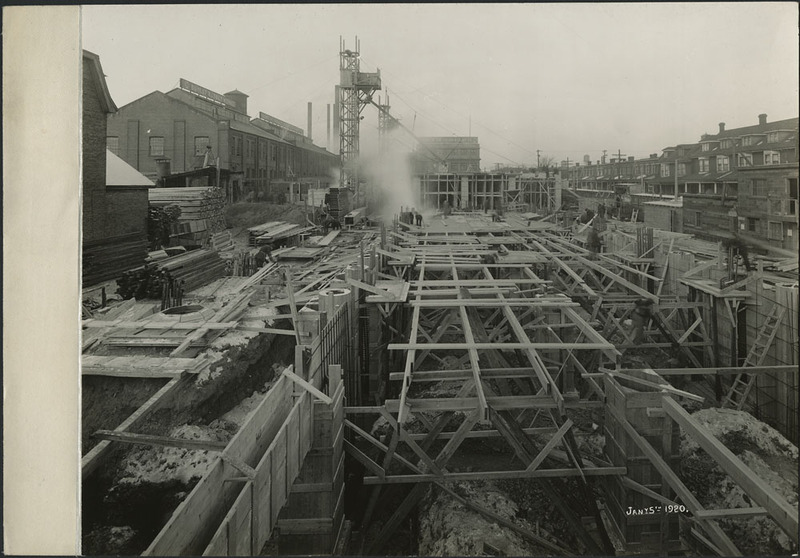 This is a visual record of that plant, a gallery that tells a story of an industrialized East End that no longer exists except in the memories of older members of the community, in stories passed down, and lives lived. There are other traces. I’ve been told that the rails from the tracks that served this giant plant are still in the basement of Jimmie Simpson Community Centre. Here is the story of that plant in pictures. 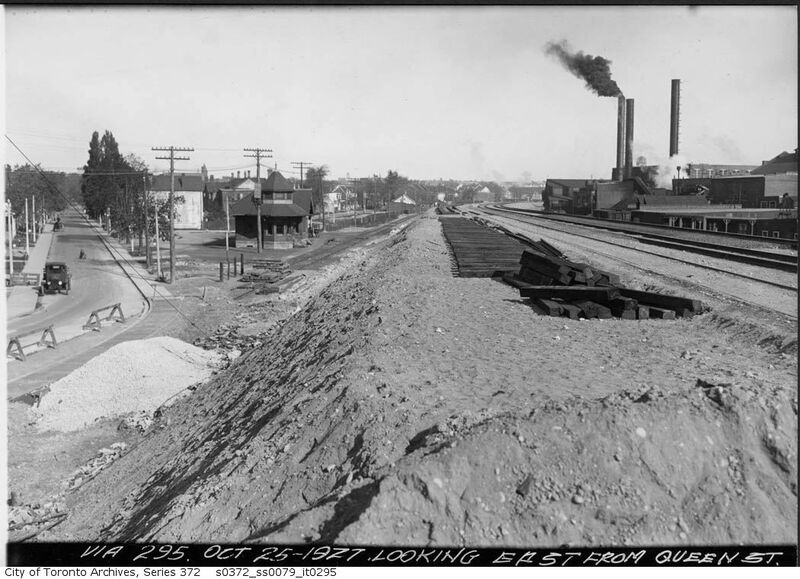 On top of the Toronto Viaduct, Looking east from Queen Street, October 25, 1927. The Riverdale Train Station is in the distance and the smoke stacks of Dunlop Rubber and Tire Company are belching out pollution on the right. 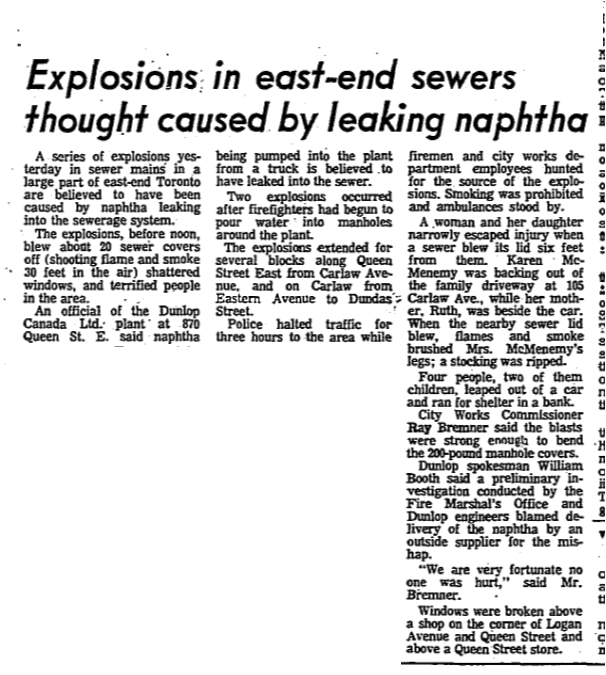 People said the stink in the air was the smell of their men working. 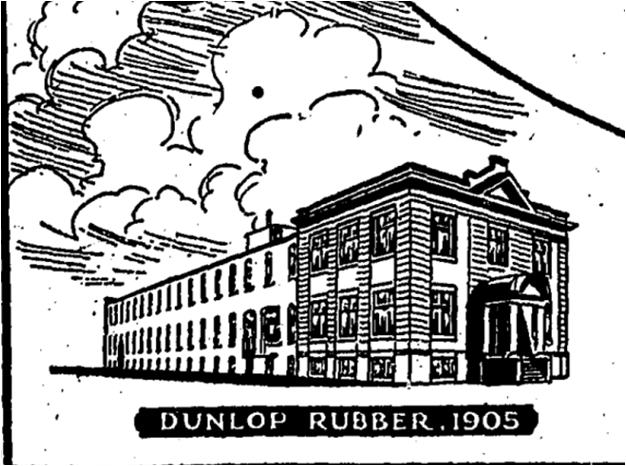 The Dunlop Head Office and Factory were originally on Lombard Street, then Temperance Street, before moving to Queen Street East. 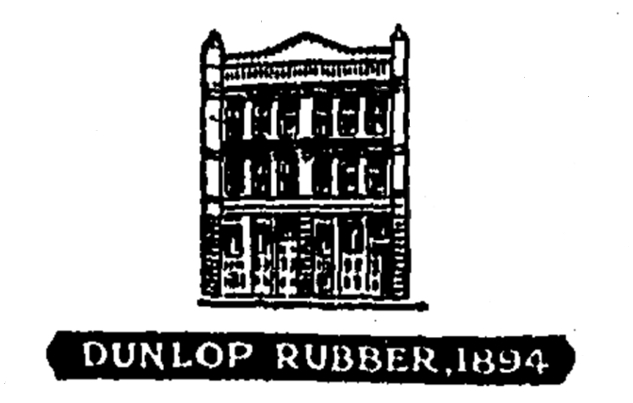 From a Dunlop ad of 1926. 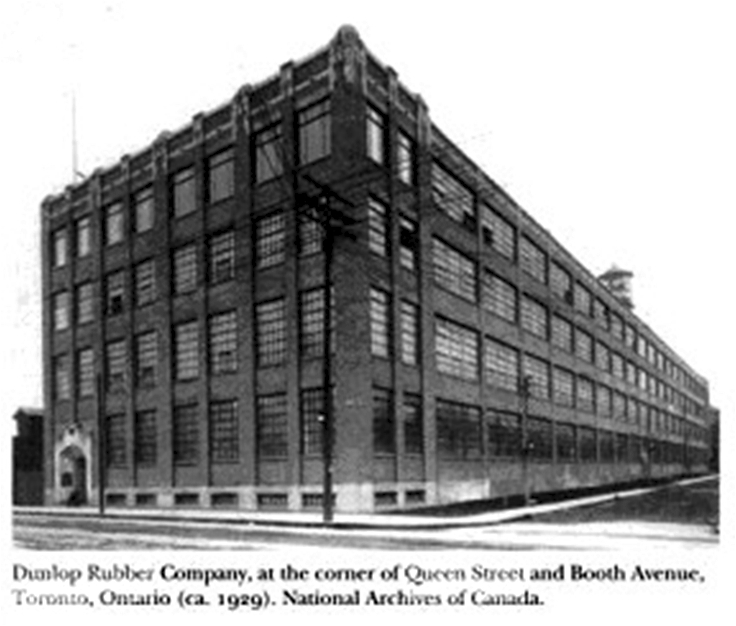 This is their first factory on Queen East and as the plant grew the original plant was incorporated into the changes. 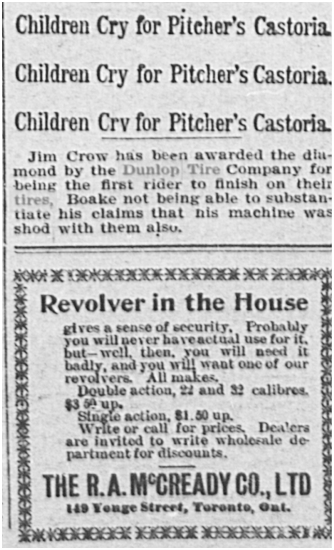 Globe Nov 4 1895 Jim Crow wins a bicycle race and a prize from Dunlop. 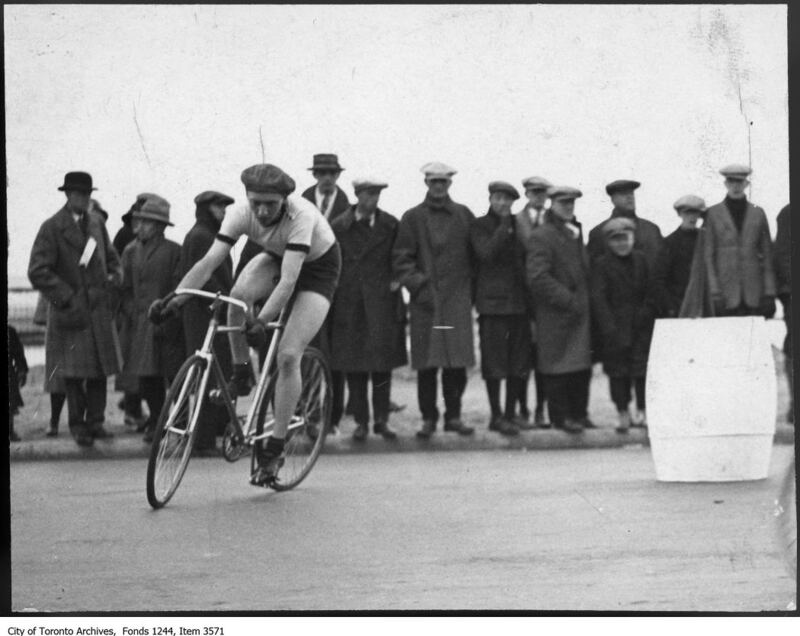 The ad below reminds us of how much Toronto has changed: handguns were far cheaper than good rubber bicycle tires and guns were much easier to get. 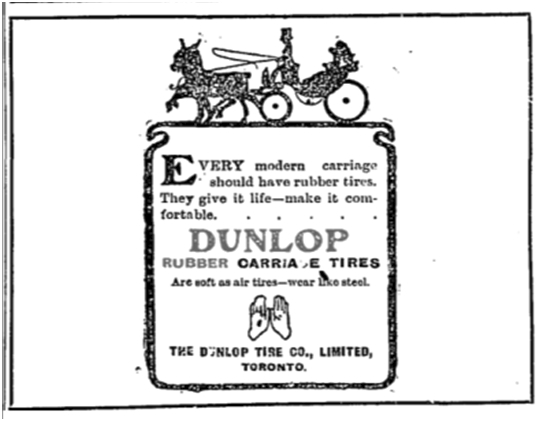 Globe Aug 27 1903 Solid rubber tires for horse-drawn carriages were once one of Dunlop’s best selling products before 1900, along with their highly regarded tires and rubber heels for boots and shoes. 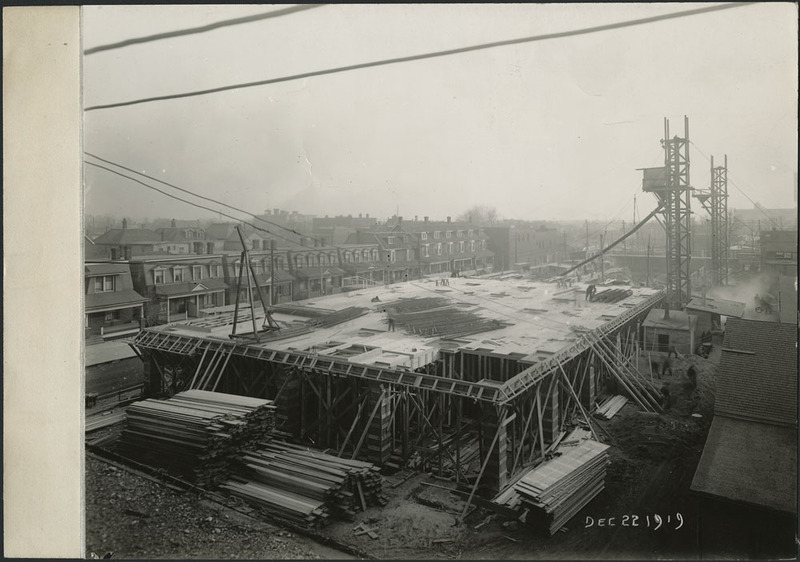 The 1905 addition at the back of the earler plant.The plant was close to the railway tracks and the new addition sat on a long last street called Suburban Place, laid out in the 1890s with terraces of houses for working families. 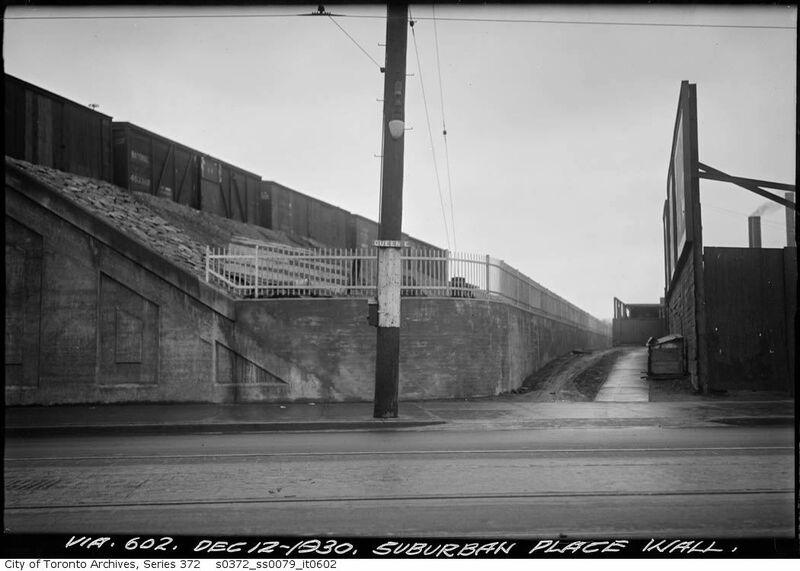 Looking north along Suburban Place with the CNR tracks on the left and Dunlop Rubber on the right. 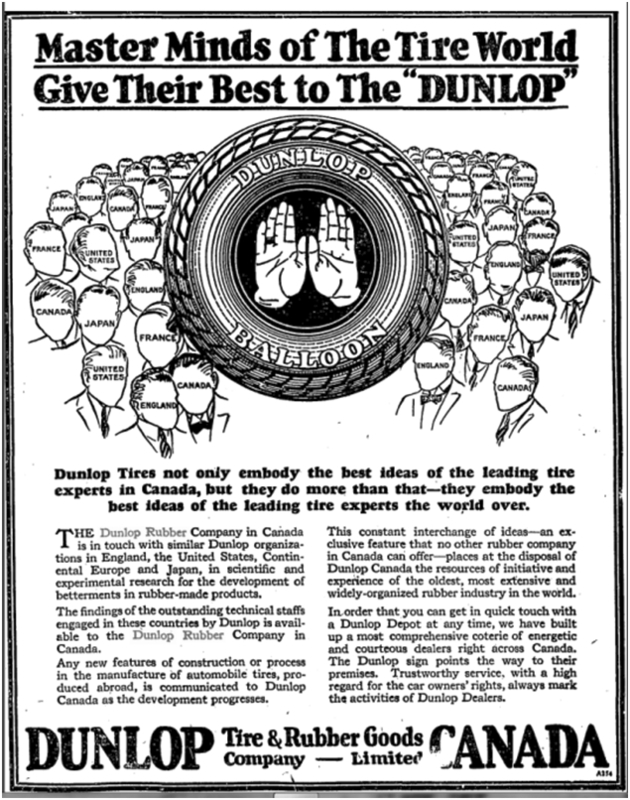 An explanation of Dunlop’s two hand logo. Building a new plant. 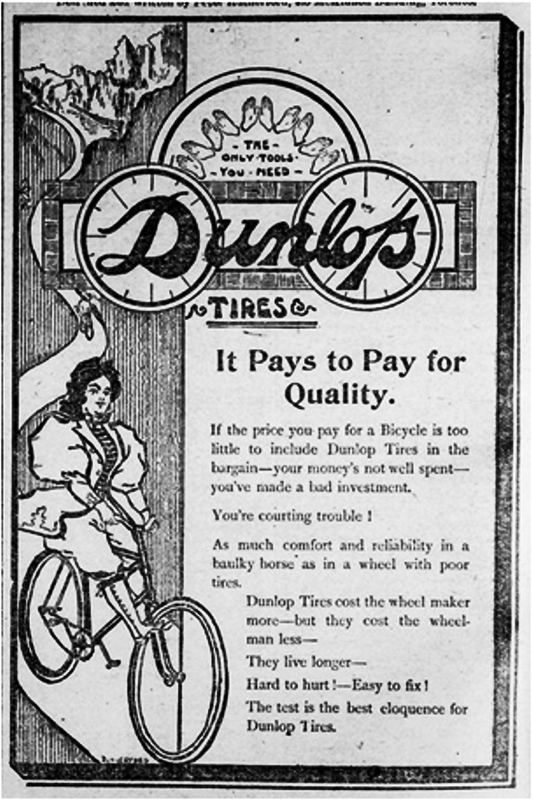 Dunlop Tire & Rubber Co. November 14 1919 Library and Archives Canada. 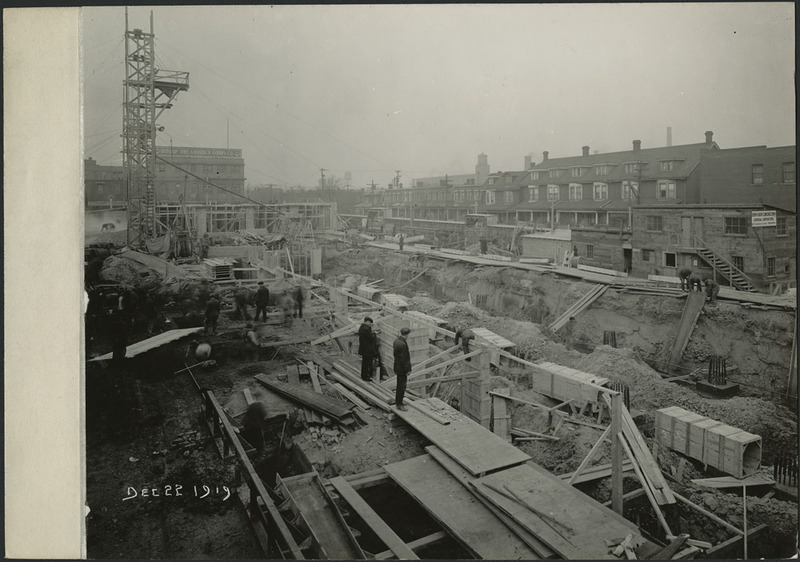 These are excellent views of Booth Street and the only archival photos of that street that I have found. 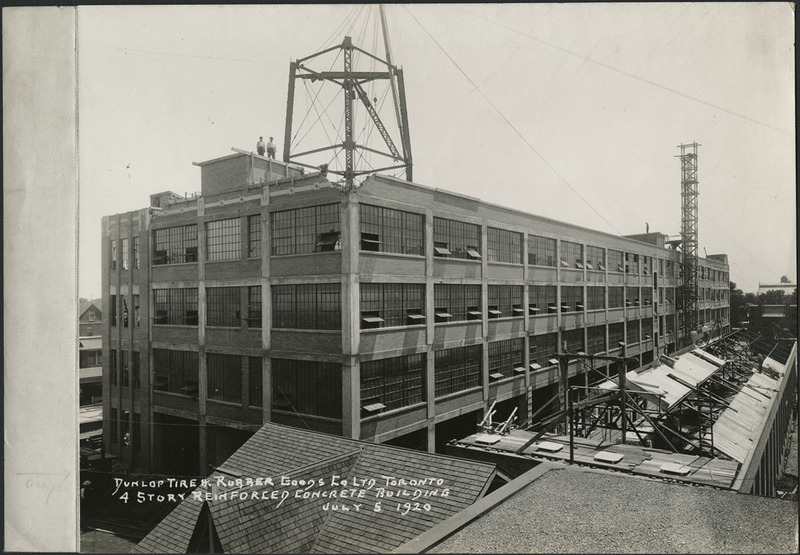 The 1919 plant as it was in 1919 when the new factory to the east was built in 1919-1920. 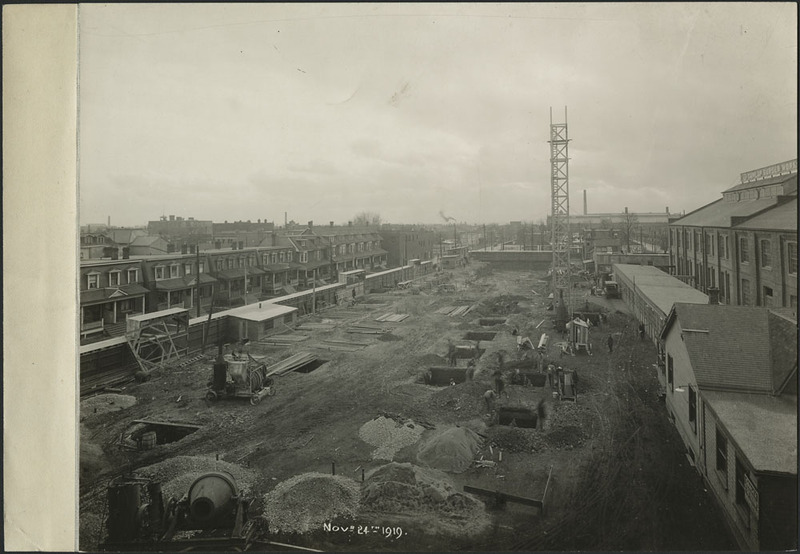 You can see parts of the old factory in the construction photos below. 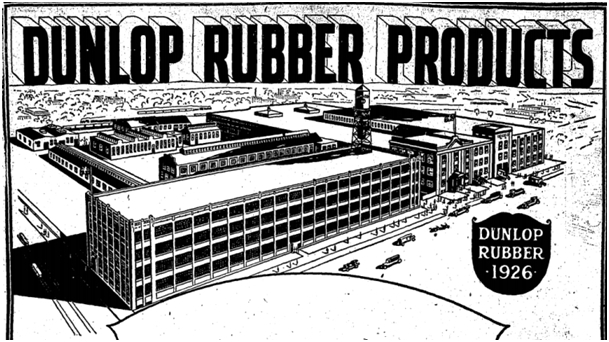 Dunlop Tire & Rubber Co. November 24, 1919 Library and Archives Canada. 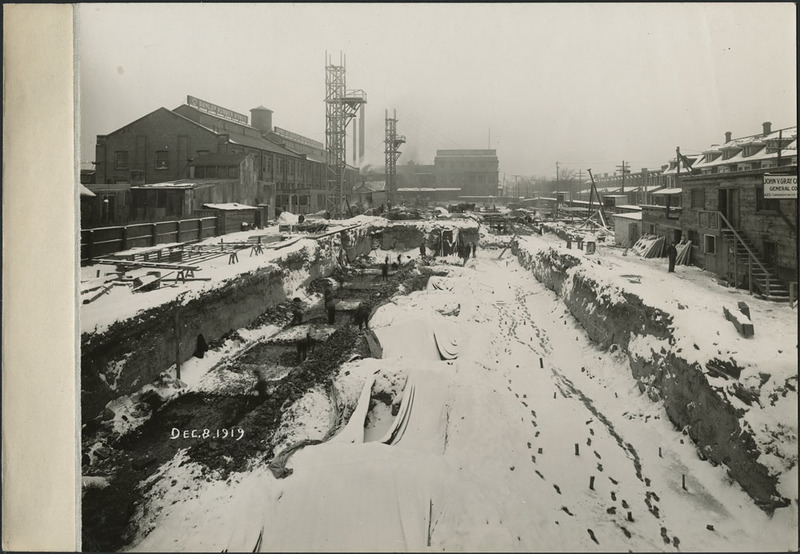 The existing plant is to the right of the photo, Booth Street to the left and we are looking south towards Queen Street. 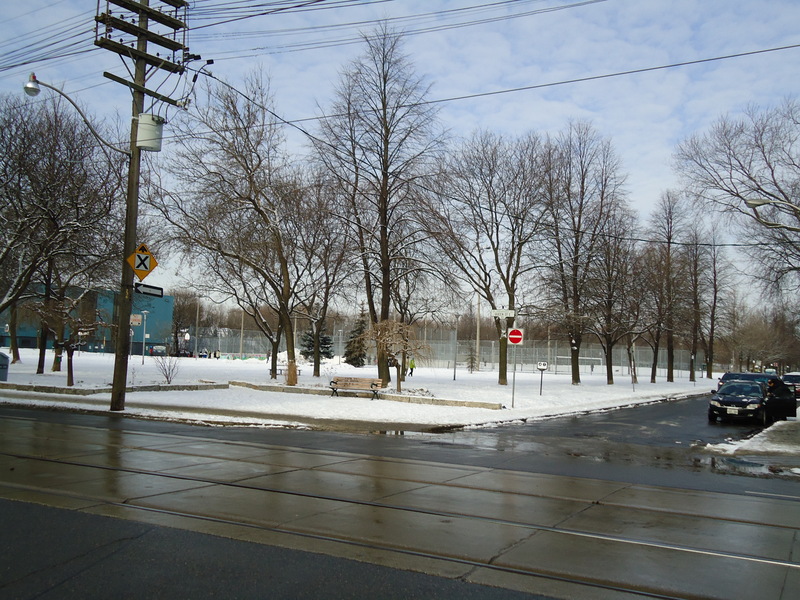 In the distance on the right is the huge British Forgings munition plant on Munitions Street in the Portlands. 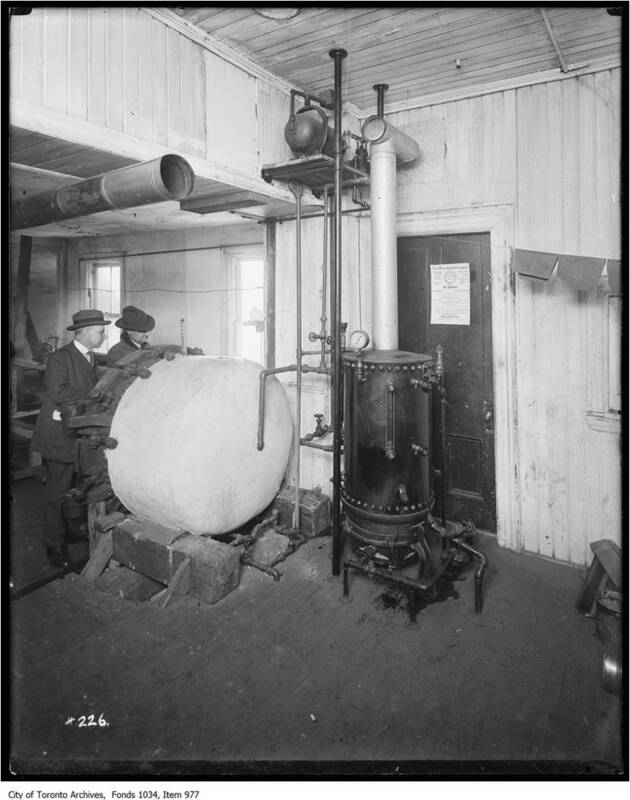 Dunlop Tire & Rubber Co. December 8, 1919 Library and Archives Canada. Looking north. 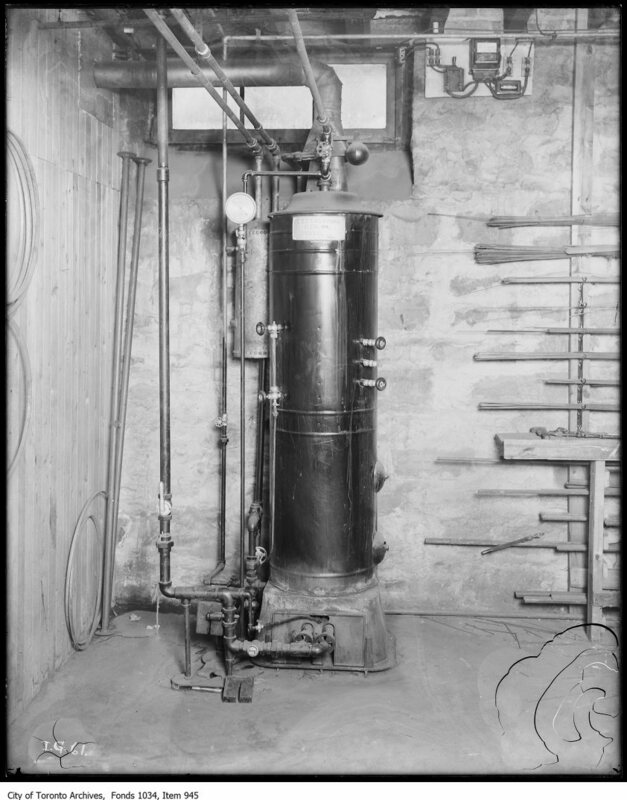 The existing plant is on the north and west. 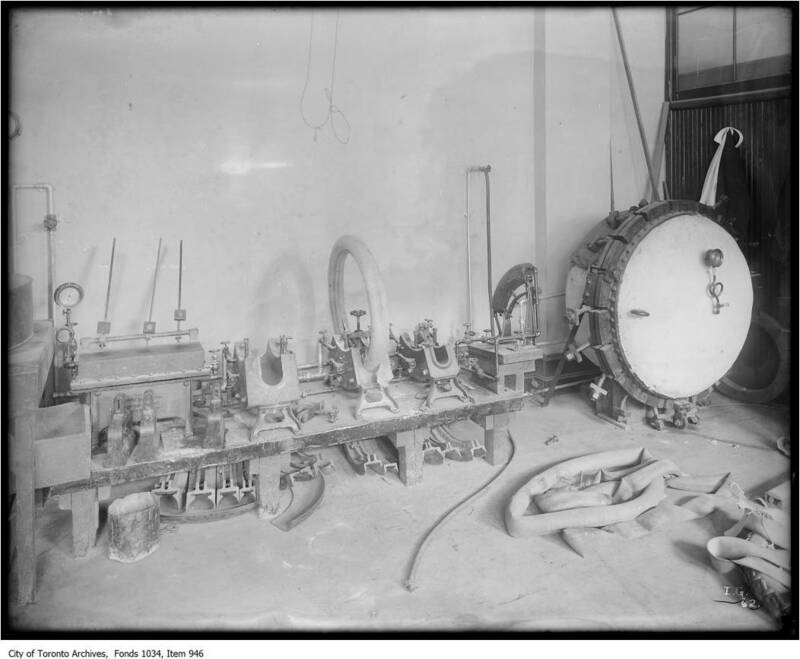 Dunlop Tire & Rubber Co. December 8, 1919 Library and Archives Canada. 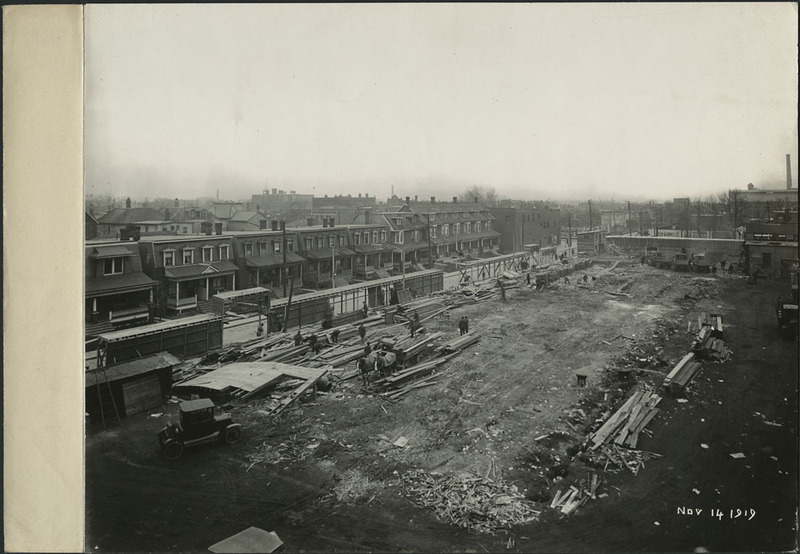 Looking south east towards Queen and Booth. 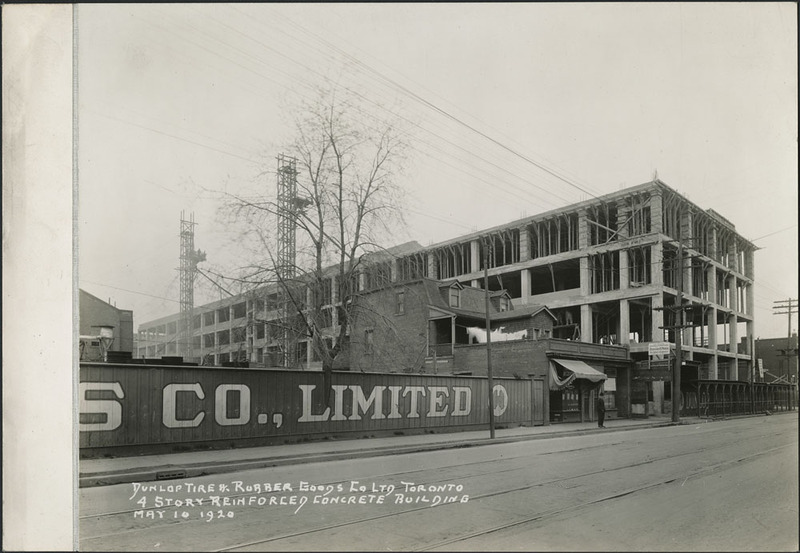 Dunlop Tire & Rubber Co. December 22, 1919 Library and Archives Canada. Looking north east towards Booth Street. 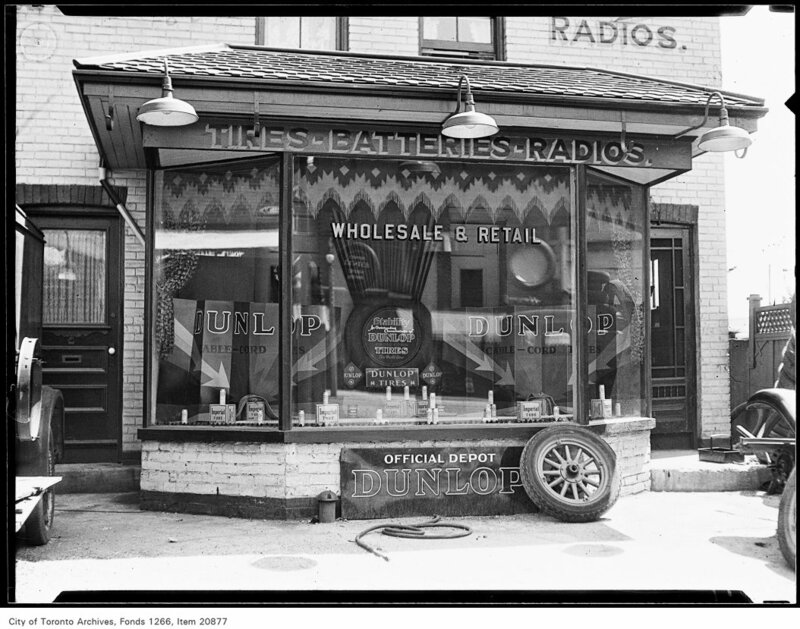 Dunlop Tire & Rubber Co. December 22, 1919 Library and Archives Canada. Looking south east. 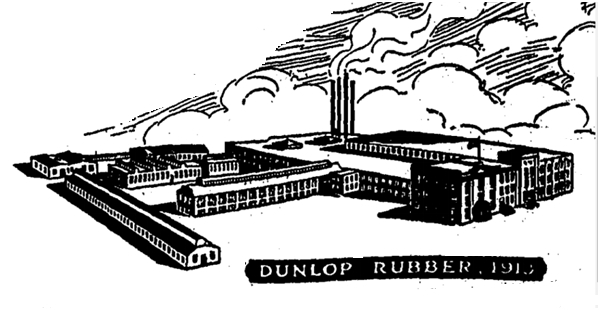 The 1920 plant in a Dunlop ad of 1926. You can see all of the various additions over the years. 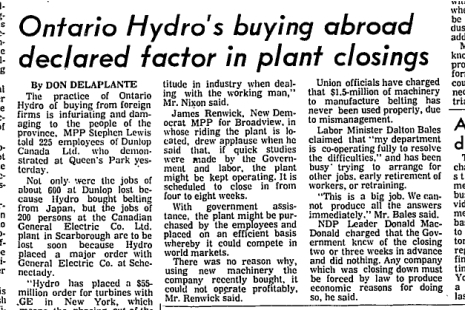 The plant employed over 700 people at one time. This view is looking north west. 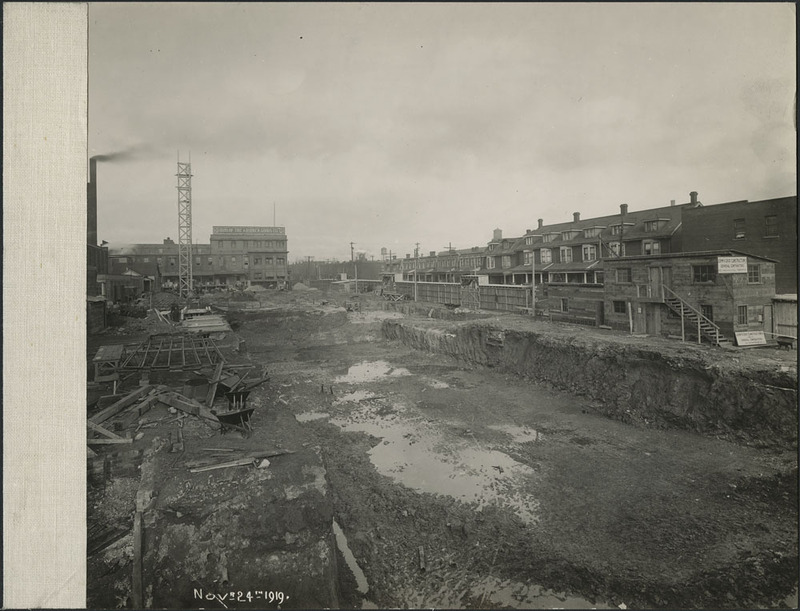 Queen Street is to the left: see the tracks and tiny streetcars. Booth is to the right. 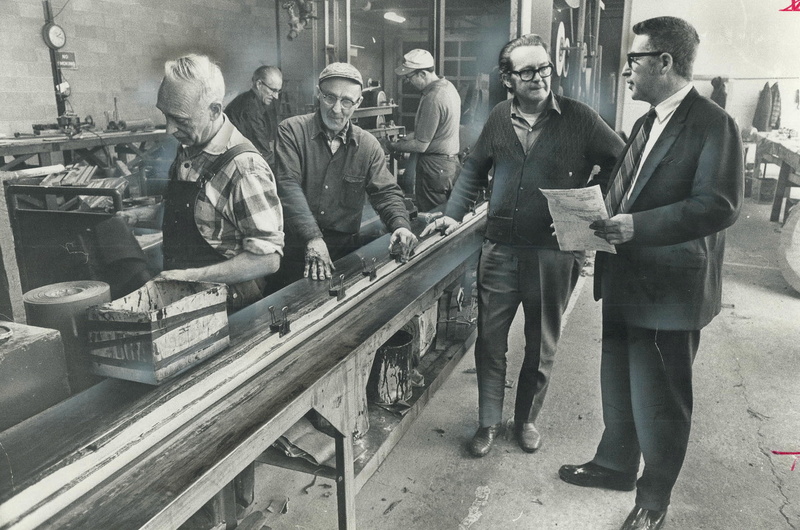 Operating their own factory in Ajax; after they lost their jobs in the shutdown of the Dunlop of Canada Ltd. plant in Toronto last May; Phil Japp (second from right); 43; and Walter Merkel (right) check production line. 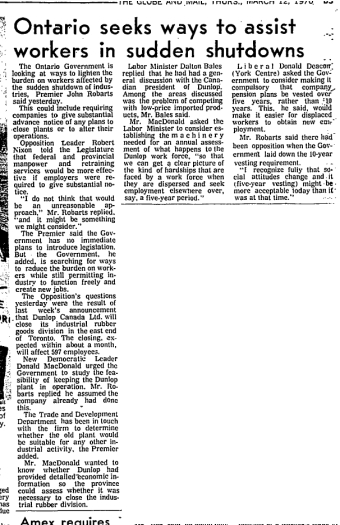 With three other partners they are turning out rubber escalator handrails; one of many products Dunlop claimed it could not make profit on when it closed down its Queen St. plant. 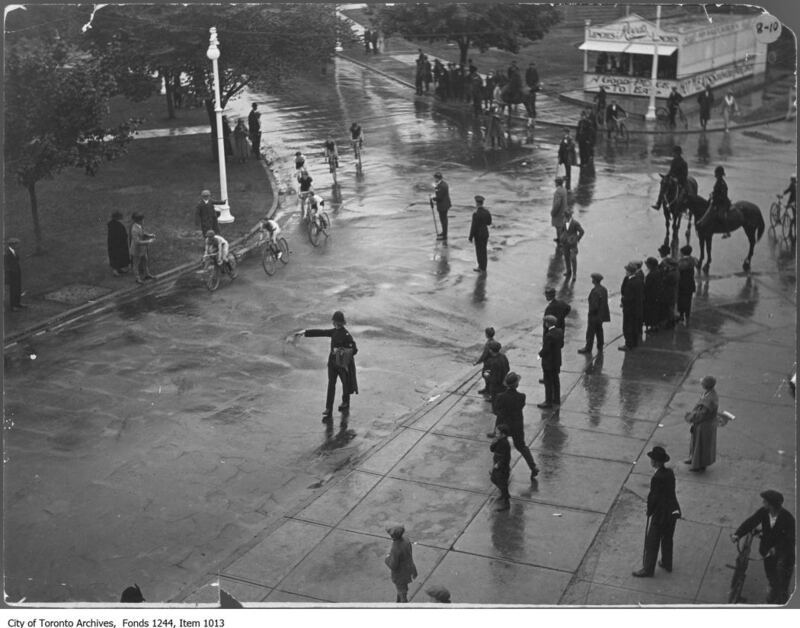 Toronto was frequently referred to as the “Belfast of the North” due to the Orange dominance here. 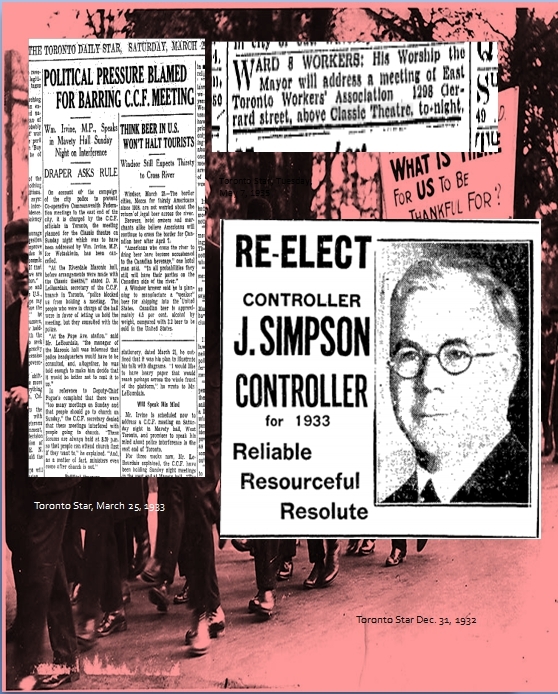 In the 1930s Riverdale helped elect the socialist, anti-Catholic Jimmie Simpson, as Toronto’s first left-wing mayor. Orangeman. 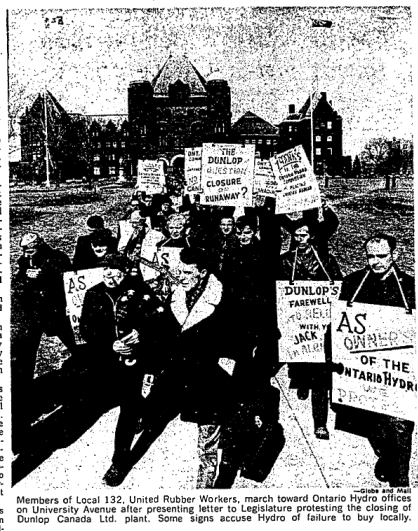 Police tried to prevent Simpson from holding political meetings.